July 15, 2015 – Former NASA astronaut and commander of the International Space Station (ISS), Dr. Leroy Chiao, will be visiting the Space Foundation Discovery Center July 16 through 18. Chiao, the Space Foundation’s special advisor – human spaceflight, will be signing autographs, taking photos and inspiring the next generation of astronauts, scientists and engineers. The public will have opportunities each day to meet Dr. Chiao, get their photo taken with him and get his autograph. Autographs and photos, as well as the Audience with an Astronaut™ presentations, are included in regular Discovery Center admission cost. 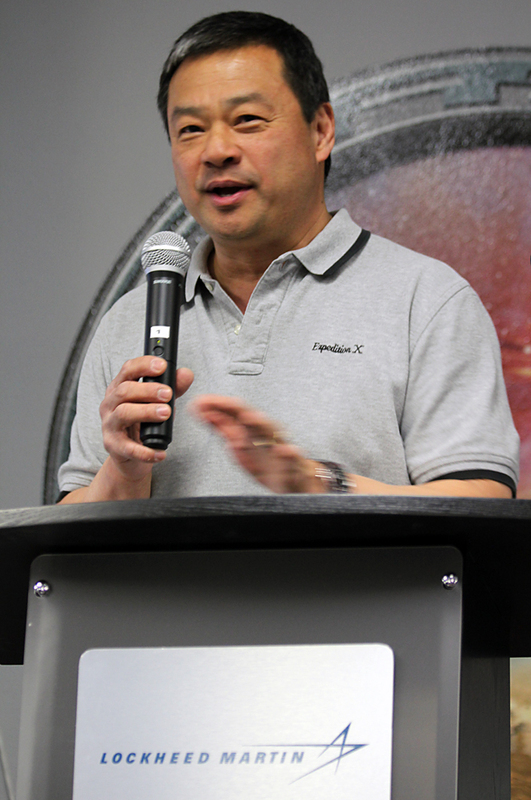 11:00 a.m., 2:00 p.m. and 3:00 p.m.
Based in Houston, Chiao is the Space Foundation’s special advisor – human spaceflight. His Space Shuttle missions include: STS-92 Discovery, October 11-24, 2000; STS-72 Endeavour, January 11-20, 1996; STS-65 Columbia, July 8-23, 1994. In addition, he flew as flight engineer 1 aboard Soyuz TMA-5 to the ISS, where he served as commander and NASA science officer for Expedition 10. He lived on the ISS for more than six months. In addition to Audience with an Astronaut on Saturday, several other events are planned for the Space Foundation Discovery Center “Super Saturday” event. This Space-cation is themed, “Exploring our Universe” and the day will be overflowing with interactive educational fun for all ages. The day will also feature a special of buy one child’s admission, get one child’s admission for free. The new film, Journey to Space will be played throughout the day. Guests will also enjoy hands-on activites in the Mars Robotics Laboratory and by creating their own spray paint art, a favorite of all ages. St. Mary’s Academy – SMAbotics_AG Team and Cool Science will also give special presentations.